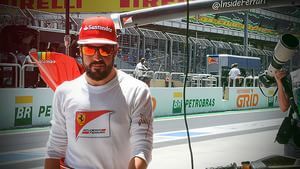 There were incidents galore in the second session of practice at Interlagos. Perhaps the biggest was for Fernando Alonso, whose Ferrari drew to a halt out on track as the engine gave up and then burst into flames. He quickly hopped out of the car and grabbed a nearby extinguisher to put his firefighting skills to the test. Elsewhere, Jean-Éric Vergne missed much of the running after the car halted, and Sergio Pérez was unable to take part after his car was put into the barriers by Juncadella during the morning session.